The present dwelling at Mount Pleasant was first built as a one-story structure, covered with a “jerkin-head” or clipped gable roof. The outline of this original roof is clearly visible in a 1930s photo of the west gable, now in the collections of Colonial Williamsburg. The recent removal of finishes inside the house exposed the interior surface of both original gables, which are clearly distinguished from later work by the color and bonding of the brickwork. Interior gable-end chimneys originally heated spaces on both floors, and these remain largely intact. The fireplace in the west room was quite large with curved corners—a common feature in early houses. The original stack of the east chimney is still visible from the upper floor of the east wing. Standing flush with the exterior face of the gable, it was laid with rubbed stretchers and headers at its corners. The brickwork of this earliest house was laid in all-glazed-header Flemish bond on the west and south walls (plinth and wall) and random glazing on the north and east walls. Above the watertable, rubbed work adorned the corners of the house. The other walls were laid with random glazing. Original window jambs have been replaced, but these were probably rubbed as are the surviving, original land-and river-front doorways. 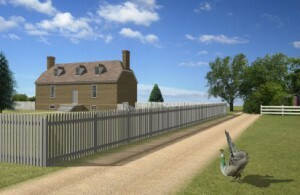 Now that interior finishes in the wings have been removed, large areas of original exterior work are visible on the end walls of the main house. Since these walls have been protected from weather and pollution for a number of years, their brick joints show little wear. They are finely laid in a relatively hard shell mortar struck with a scored joint, conventional for the period. 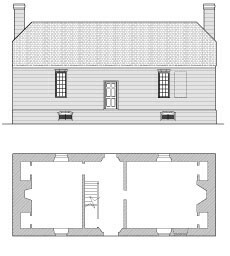 The ground floor of the house was laid out on a central-passage, hall-and-chamber plan, with the west room serving as the hall or principal living space. This larger room was roughly eighteen feet square, excluding the alcoves that flank the chimney. These secondary spaces were cordoned off as closets and provided with shelving.1 On front and back walls alike, there was originally just one window, each centered over the cellar window below. In each case, one jamb of the original window seat survives, the opening having been filled in with later brickwork. It is worth noting that these earliest windows were centered with respect to the exterior dimension between the centerline of the doorway and the corner of the building and outwardly mirrored the fenestration of the eastern end of the house. Period I plan and conjectural elevation. A riverside door was planned for the hall but was abandoned during construction. Judging from other early houses in the region, the door to this, the principal room, probably stood on axis with the fireplace, as at Smith’s Fort. Assuming this was so, it would have been necessary for the stair to ascend along the east wall of the passage, much as it does today. The evidence for this arrangement is indirect, since the original passage walls are gone. However, the position of a second-floor doorway to the ca. 1800-1805 (period III) east wing makes it likely that the stair landed at the south end of the upper passage. On both floors this would have allowed the door to the east room to stand en filade with that of the wing. Granted the 1800–1805 configuration of the stair supposed here, it seems likely that the earlier stair ascended in the same way. In that case, the door to the east ground-floor room, would necessarily have stood against the south wall to make way for the steps. The original passage walls were dismantled after an 1898 fire (further discussion under Period V). Racking for these partitions shows that they were originally of masonry construction and that the passage measured 10‘-11 1‘2“ brick to brick—several inches wider than the present entry. At the level of the second floor, a large girder was let about 4 inches into each of the passage walls. These girders were seated at different heights, so that the passage joists and stair header notched over one but tenoned into the other. This allowed the carpenter install the joists after the passage walls were completed. The joists ran in an east/west direction so that the flooring could run with the length of the passage—an almost universal practice. (Indeed, the floors were sometimes re-framed in houses to which passages were added solely for the purpose of running new passage floors in the right direction. Bacon’s Castle in Surry County and the Ritchie House in Tappahannock are two such examples). At either end of the passage the masonry openings for the land and river-front doorways retain their original jambs, though each was rebuilt at the head c. 1800 and again in the 20th century. Nonetheless, it appears that neither had a transom, there being early brickwork above each, and no sign of bearings for a lintel that would have been necessary to support brickwork over a higher opening. Assuming a width of 5 1/2“ for the door frames, the finished height of each doorway was about 7‘-1“. The east ground-floor room probably functioned as the chamber—the principal sleeping space—before construction of the east wing. As in the hall, the remains of period I window seats are still visible on the front and rear walls, both filled in with later brickwork. Here too, the spaces to either side of the chimney were initially cordoned off as closets. In these spaces, slots cut into the brickwork indicate the former existence or shelving. It appears that these shelves were removed and the slots closed up in period III. Unfortunately, there remains no plaster or other evidence of finish that can be confidently associated with this earliest period in the dwelling’s history. John Hartwell Cocke, son of Richard, seems to have been living on his Surry County plantation when he drafted his will in January 29, 1791. The will was proved after his death a month later in the Surry County Court.3John’s wife, Elizabeth, had life rights, with conditions, to all her husbands property, but she soon died, and guardians were appointed to oversee the maintenance and education of the children.